As discussed above, you should seek to use the smallest EE which give you all the features you require. Practically speaking, when creating a new OSGi bundle J2SE-1.8 is a reasonable starting point. Given that this version is currently actively maintained by Oracle (see [http://www.oracle.com/technetwork/java/eol-135779.html Java support by Oracle]) and the pervasive use of generics in both the OSGi framework and other libraries, lower EE settings are only practical in very specialized applications. If your particular bundle requires capabilities from a later EE, then specify a higher EE, but keep in mind this may limit adoption of your bundle for applications using an older Java runtime. Projects should not leave these choices to chance. Dependency structures are key parts of an architecture. 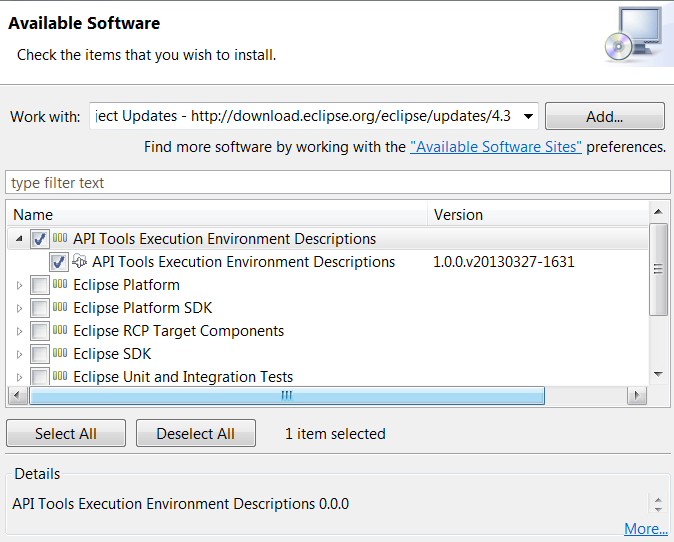 For example, the [http://eclipse.org/eclipse Eclipse Project] has explicitly identified EEs for all of their bundles. These choices are documented in the [http://www.eclipse.org/projects/project-plan.php?projectid=eclipse#appendix project plan]. The execution environment listed in the table is based on the needs of the bundle and the expected use scenarios for the bundle.